I thoroughly enjoyed this experience. From the first contact that I made with the Teaher to register and throughout the workshop, I felt like I was coming home. The Teacher was so open and helpful. He also took steps to ensure that I was connected with someone from the area, who could help me when I first arrived in Toronto. Words cannot express the gratitude that I am feeling. The exercises and meditations bought me closer to how I want to live my daily life. The healing and experiences were profound. The teacher and others who were assisting him were so welcoming and helpful. After the workshop I walked away feeling so very connected with everyone, the universe and myself. I felt so much love. I learned how important it is to stay in your heart. My view of others and of situations feels so much different. This workshop has changed my life. Thank you, thank you, thank you from my heart. I definitely recommend this workshop to others. Daniel is an excellent instructor and a beautiful human being. He showed love all the time for us and it was very important for me. Thank you dear master. My experience during the Awakening the Illuminated Heart Workshop was amazing, and I am already seeing changes in my life just two days later. Daniel Mitel is a wonderful speaker and I knew I was in the presence of a loving spiritual being. I personally had some difficulty understanding him at times as he has a thick accent, but this is the situation for me many times and something I am used to. The venue is a children's school with small chairs, and so was somewhat uncomfortable. The course material and my experiences over the four days more than made up for some physical discomfort! Hi Sharon, Thank you for your nice message. Related with my accent...if you understood the message of the language of the heart is good! Another Amazing course presented by Daniel Mitel. I am so grateful to SOR and Daniel for these life changing teachings. The healing day was so transformational, the meditations brought me so much peace and serenity. I found the course great value for money at only Â£370 for 4 days. In Truth you cannot put a price on how valuable the course has been for me. I practice daily. I am so grateful. Much love Eloise ???? I feel very blessed and am very grateful for Daniel's time and teachings that he shared with us on this truly enlightening course. I have met many great teachers but Daniel is not just a teacher he is Master. Namaste. This workshop is excellent in every regard. Many thanks once again to all. i was disappointed that this information was so tightly bound to the controlling fiat monetary control system .From leaving home travelling expenses +course fees accomedation &catering the experience cost me well over $1000 dollars. For many of my freinds who slave for the minium wage it was way too much money for them. This is a completely inaccurate and incorrect message. Andy Reid attended three workshops in Wales: Awakening The Illuminated Heart, Kriya Yoga and Heart Imagery. The fee for Awakening The Illuminated Heart was 370! A lot of participants received discounts and workshops fee reductions. I have done this workshop couple of times but this time in Bucharest, with 151 participants, it was magnificent. Thank you Master! We were 151 people attending an workshop that changed our lives with a real Master. Thank you! It was a unique and an unforgettable experience for me. Aside from the content of the workshop; meeting with Daniel Mitel and learning from him and hearing his worldwide experiences was amazing. I've been repeating the exercises and meditations from the workshop since then. I recommend everyone to take this workshop and start their awakening process. I really would like to thank Daniel Mitel for his effort and kindness and for making available this wonderful knowledge and experience for us. It has been such a bliss. Thank you for a great workshop and to a great teacher; a life change event! I truly enjoyed attending the ATIH workshop. For the past year, I have been experiencing a 'psychic attack'. Over the years doing energy work, I think I was expecting very male energy at the workshop, and I was surprised and moved by the feminine energy of this meditation. In muddling through it in my daily life, there is a lot of healing happening and this is great. While the attacks have abated, they still show up but I will continue to work towards empowerment and freedom....doing the light work finally makes me feel like myself and I just want to live in that space. Thanks to Daniel for facilitating the workshop and to all of the participants - it was a great experience and I would do it again in a heartbeat. Daniel is clear, simple, profound, and goes directly to the essential. For me, this method of teaching is exactly what I need to keep me aligned on my path. From my heart, thank you Daniel. It was a real journey to the heart where there is no polarization and only light and love and peace.. Thank you..
my 5th workshop, and felt like a new one :) but with a deeper understanding and more profound experiencing. Daniel is a great teacher, as usual, and the subject of living from the heart more actual and needed then ever. I simply love this workshop, thank you all! Thank you so much for this amazing experience. Amazing Tools. Excellent, as always. Only practice and trust in myself are needed now. It was truly amazing and gave me a strong confident that all the new learnings where correct. Still old habits die slow and new better habits are hard to get as habits but still I am meditation and it is getting easier to do it at a regular basis.. Meeting Daniel was my first meeting with a master in real life it was a great experience. Daniel is a great person and a great teacher. I absolutely recommend this workshop! Daniel was amazing! He has so much experience and is a great teacher. Huge value, huge modesty. . In short; I felt deeply respected and the teacher, Daniel Mitel, radiated of a rarely seen innocence and utterly real love. It was a protected and most encouraging learning environment. I can only salute and truly appreciate the service and work of the whole team. It worth doing this magic workshop with Daniel Mitel. He is a Mystic. His love has a unique quality. His love is not moralistic and he is teaching us to live now in this moment. Because he is so pure and opened, being near him makes easy and funny the journey to the heart. I can't wait to join again his workshops! Another great spiritual workshop taught by a Spiritual Master: Daniel Mitel. I read his book \"This Now Is Eternity\" and felt that I need to do again Awakening The Illuminated Heart Workshop. Sometimes just to stay and listen to a Master is enough! The workshop was excellent in every way. I am so blessed to have been part of it. This workshop was a wonderful experience for me. It was by far the highest standard from anything I have done before and being taught by Daniel Mitel was a great honor. The workshop gave me invaluable knowledge and profound experience. It awakened past knowledge and reconnected me with my essence. It offered me the greatest gift of all: \"To create from an illuminated, awakened heart!\". A gift, we all owe to ourselves. Thank you Daniel and Agathe. My overall experience of the course was inspiring and fulfilling. I highly recommend it to anyone who feels the call of the heart. Thank you Daniel you are a treasure to this planet. Loved the Awakening The Illuminated Heart course. I now have some tangible tools to meditate with and help direct my life. Mind-blowing without the used of drugs. I found it a bit confuseing finding my way to payment, but later videos related to this has been released at youtube. It is recommendable to pay through the website of the school of remembering, for registration of ones attendance, so that one can retrieve the certificate easily. I found it comforting to know that Daniel Mitel could see the energies and give good support in the prosess. Daniel is a truly inspiring spiritual teacher. His wisdom, kind heart and genuine humility make him an outstanding individual - and of course his sense of humour. The whole four days felt effortless and I have been meditating in the tiny space of the heart every day for the past two weeks as well as activating my beams of light. I feel so grateful to have been part of the London course and would definitely recommend Daniel to anybody considering the ATIH course. This will take you on a journey far greater than any other Life Purpose. This was my second ATIH workshop. The experience was different in the best way possible. It feels like I've gone deeper, like peeling an onion. Deeper and deeper. I'm so grateful. Thank you Master Daniel! Amazing experience. It has opened the portal to the Truth. Daniel is a real Master, I feel very blessed to have him as my teacher. Definitely one of the most wonderful workshops that exist. I salute you from the TSOH. Namaste. A truely life changing experience. I feel that it has taken my understanding to a higher level I recommend the workshop to every spiritual friend that I meet. I do not have the words to describe how powerful the experience of this workshop was. It was of the highest order of excellence that I can perceive. Its value was inestimable. My wonder and gratitude is manifold. Thank you so much. Daniel was an amazing teacher. I would go back to the same session for more experience with new people. From my heart, thanks for this gift! ATIH workshop is a must for anyone searching for something missing in their life. It is a doorway towards seeking the truth about the universe and an amazing way to connect yourself to your higherself through your heart; leading you a step closer towards ascension.Daniel Mitel is honestly the most amazing and down to Earth Master you'll ever meet...He delivers what's necessary to easily get urself from the brain to the heart and helps activate your Merkaba field effortlessly...You will always want more i promise!!! An incredible teacher and an amazing workshop. I absolutely loved the Workshop it was awesome ! it's such a precious gift to the world , I highly recommend him , he is a true Master . I'm so passionate about these teachings that, I also wish to become a teacher myself and share this wonderful process with as many people possible, in service to the One Love . This was a life changing event. Thank-you! I have learn far more than I expected from participating in this workshop. Now that Drunvalo and Daniel have come into my experience I and confident in continuing my quest for knowledge and enlightenment. Thank you. Daniel is a wonderful teacher, committed, full of Love and he has a good sense of humour. I always recommend this course to others. It is a necessary foundation in today's world. Over the last 20 years I have been studying and practising many healing modalities and attended many different kind of spiritual workshops and self empowerment courses. I include this course to be among the two top workshops ever. The information, wisdom and techniques included along with the amazing presence of a real Master like Daniel Mitel, left me with no less than pure gratitude and a full open heart, filled with Love, understanding and compassion. It was not enough time to sink into the meditations. For me I got a lot of questions answered that was important to me, bu still I was stressed after the workshop. I felt an underlying rush during the workshop and also that the maskuline was stronger than the feminin. Something that gave me a feeling of something missing. I have done the second time the workshop with Daniel; it is worth to do it again! We are blessed to have a Master like Daniel Mitel here on this planet; the way how Daniel is teaching and helping people reminds me about Ramakrishna and Osho. Thank you! Daniel is a real Master. When he spoke we felt that Drunvalo Melchizedek was there. We felt that Daniel is connected with Ascended Masters and he is bringing to us the core teachings of Melchizedek Consciousness. If you want to change your life meet Daniel! Daniel is a real Master: I have done again ATIH workshop after more than a year and the experience was incredible. I would recommend to all students who have done it once, to do it again second time as it is amazing; you understand it more profoundly and deeply. We spent four days with Daniel and he made us to understand the divinity inside of us. In this world separated by polarities, Daniel is one of the best Master in meditation and in Creation from the Heart. His energy and light is amazing. Big thanks for another amazing workshop! My first workshop with Daniel was a revelation. Daniel is a real Master and his teachings are coming from the highest level of consciousness. Daniel is bringing something unique in his teachings: his experience as a Master in this world and the other dimensions. We were almost 50 people in his workshop and all of us felt the divinity coming through Daniel. Anybody on this planet should take this workshop and if you have possibility to take it with Master Daniel then the experience is complete! thank you so much with all my heart!!! Daniel is a heart and soul person and an excellent teacher. We are fortunate to have him teaching in our area. This was my second time taking ATIH. I strongly suggest taking it more than once as the second time is a whole new experience! Daniel Mitel is pure unconditional love, to spend four days in his presence and experiencing his essence is life changing in and of itself! One Love! This was the absolutely best workshop. Daniel is an astonishing person. I have the highest regard for him. Any questions I rated less than 5 are related to my own lack of practicing the meditation, and nothing to do with Daniel Mitel's teaching, or Drunvalo's work. Every two of workshop I was feel as well. Tha cleaning day was very effective. Thank you so much. Daniel is very good teacher. Would prefer to have some handout material so that I don't have to be distracted by the note taking process. I thoroughly enjoyed it, Daniel is a great teacher! Not enough time or instruction of the process of connecting the tiny space if the heart to the merkaba. Language barrier. I personally found my sensitivity to subtle energy's to be focused more to feeling and hearing, so before I had a teacher to help guide me through the steps, I was unclear as to the process I was preforming. 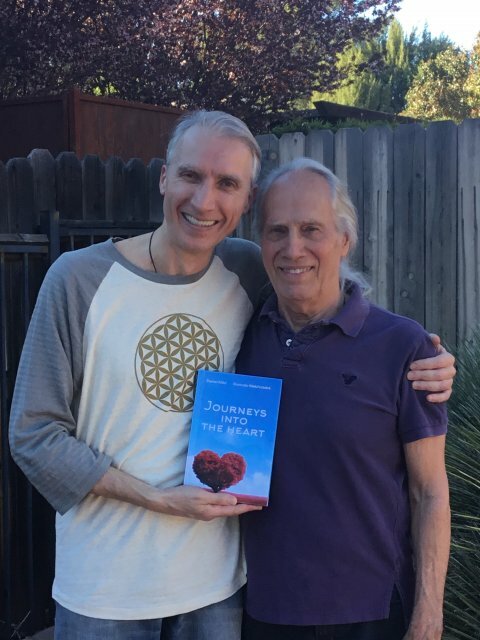 Daniel and this course cleared up a ton of questions and uncertainty about my meditations, I am so thankful that there are people in the world who can help with such compassion with so meany things like this, and Daniel lived up to all of what I was expecting! Thank you Daniel, Thank you Drunvalo, I don't know where in my life I would be without this light! All my heart goes out to both of you and all the people who teaches this, along with the universe that supplied the love needed to show people the way. I love you all! It was a wonderful four days filled with love and light. Daniel is an excellent teacher who imparts his knowledge and enthusiasm to his students. Well, I was very inspired by the events of workshop during all 4 days in Kiev. And I want to emprove my practice on the entering in tiny space of the Heart. Big hugs and many thanks to Drunvalo and Daniel Mitel for spreading so great teaching!!! It was a great experience with the one of the best teachers, Daniel, this workshop made up my mind to become a teacher. It was a powerful experience. I released a lot of deep sadness although I am still not clear what that was about. I know however that that experience has changed me...I would highly recommend Daniel - he is a powerful, knowledgable and loving teacher. Thank-you Drunvalo. Daniel is a wonderful teacher and I feel truly blessed to be his student. I can say without reservation that my ATIH experience was a life changing event for me. The shift from my brain to my heart has been my doorway to peace, love and joy. Thank you for this gift. Can't wait to see Daniel in Romania again!!! Heart to heart, Higher Spirit to Higher Spirit! I am deeply grateful for attending the ATIH with Daniel , as he is a true authentic teacher and a true example of Drunvalo's teachings. The experience was life changing, and to-date has been the most powerful and profound workshop I have ever taken. I am grateful to and love Daniel very much.